An area to the west of the port was developed into an iron foundry where all sorts of materials were made for use in the steam ships that were built in the port. In 1881 Mr Heth Jones was manager of the foundry. 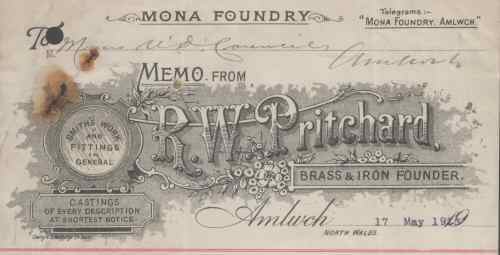 Many ornate iron gates and railings were made in the factory as well as parts for the new iron ships being made in the Amlwch ship yards. Local memory is of a large building with a steel floor. At regular intervals in the floor were square holes. Metal sheets were heated in the furnaces and then place against pegs in the holes of the floor. Large metal wedges where then knocked between the sheets and the pegs, to curve the metal into shapes which had been drawn on the floor in chalk.